Thanks to BHPian AutoNoob for sharing this image with other enthusiasts! 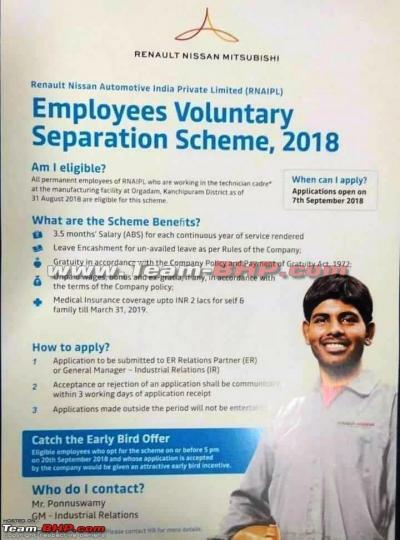 Renault-Nissan is offering voluntary retirement (VRS) to its employees at the Oragadam plant. All permanent employees working as technicians at the manufacturing plant as of August 31, 2018, are eligible for this scheme. 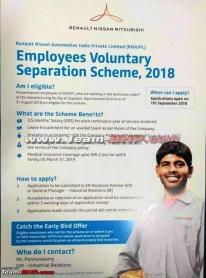 As part of the Employees Voluntary Separation Scheme, 2018, the carmaker is offering 3.5 months salary for each continuous year of service, leave encashment for un-availed leaves, gratuity, unpaid wages & bonus as well as medical insurance coverage up to Rs. 2 lakh for the employee and his family till March 31, 2019. Employees who opt for voluntary retirement on or before 5 p.m. on September 20, 2018, will be offered additional early bird incentives. According to a media report, Renault-Nissan is trimming down excess workforce at its manufacturing facility. The company has said that employees will be offered voluntary departure and that no one will be forced to quit.